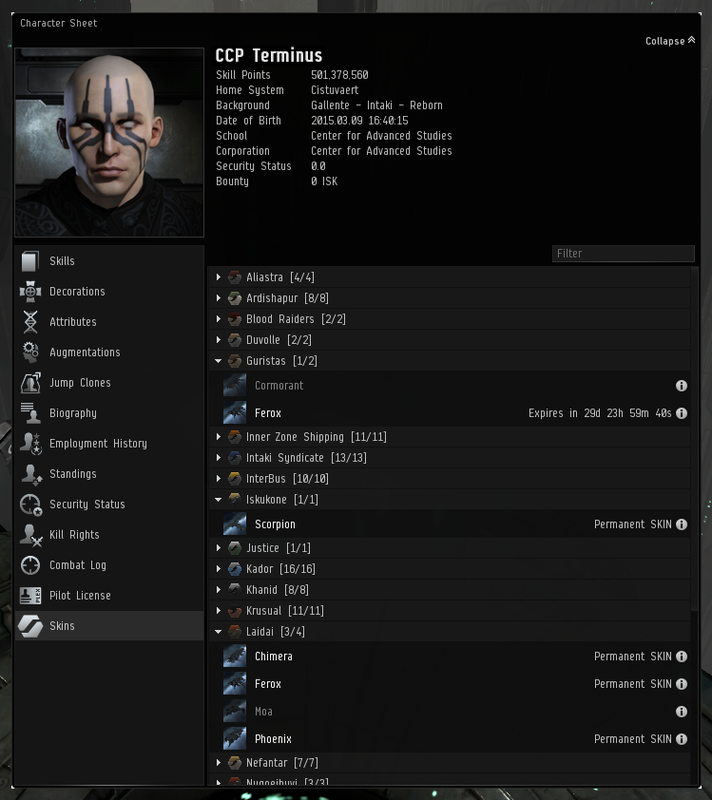 CCP Terminus here to talk about Super Kerr-Induced Nanocoatings (aka SKINs), the new visual customization system coming to the spaceships of New Eden. This blog will also go into the details on how we will be converting from the old system to the new SKINs, which will launch with 102 brand new SKINs. If you're wondering how the old system worked or are curious as to the reasons behind the change, please reference CCP FoxFour's excellent dev blog. How many of you DIDN'T try to ship spin that amazing image? If you didn't then I suggest leveling up your ship spinning skill and trying again. With Ship Paint Pilot Program, you would manufacture a custom ship by combining a blueprint of a paint pattern and a packaged version of the base ship. This meant that the paint patterns fate was locked to the fate of the ship. So for instance, if you wanted to self-destruct a bunch of Interbus Moros' instead of flying them halfway across New Eden, the paint style would go with it. In contrast, the new SKIN system acts much closer to the way skillbooks work in EVE. Each SKIN variant comes as a SKIN item (a licensed pattern), which you can activate for your character or sell on the market. This character then has access to the SKIN for any ships that it applies to, meaning once you lose a skinned ship, you can simply hop in to another and reapply the SKIN pattern. If your character loses their pod and dies or jump clones from one location to another they will still have access to use all their SKIN's. You can now buy SKINs (with Aurum) from the New Eden Store, in the Fitting screen, or the 3D Preview screen. Before activation, each SKIN is an item which can be bought and sold in the market (for ISK), can drop if it's in your cargo and your ship explodes, etc. SKINs are used by activating them for a character, giving that character access to SKIN variations that the item covers. Permanent SKINs exist as items which are bought from the NES. Once activated for a character they last indefinitely, and allow that character access to visual variants for a certain ship or collection of ships. Other characters on the same account will not have access to the SKIN. The reasoning for having time-limited SKINs comes down to a few factors. First, we want the SKINs you find in-game to retain their ISK value by preventing market saturation over time. By having them time-limited, we create a continuing demand for the SKIN, which keeps the loot valuable. Time-limited SKINs also allow for a number of promotional opportunities like SKIN giveaways, and possible try-before-you-buy options in the future. The selected SKIN can be changed at any time while you're in space by opening your fitting window and selecting a new SKIN. Though the magic of nanites, electric fields, and SCIENCE! the outward appearance of your glorious ship changes before your very eyes. 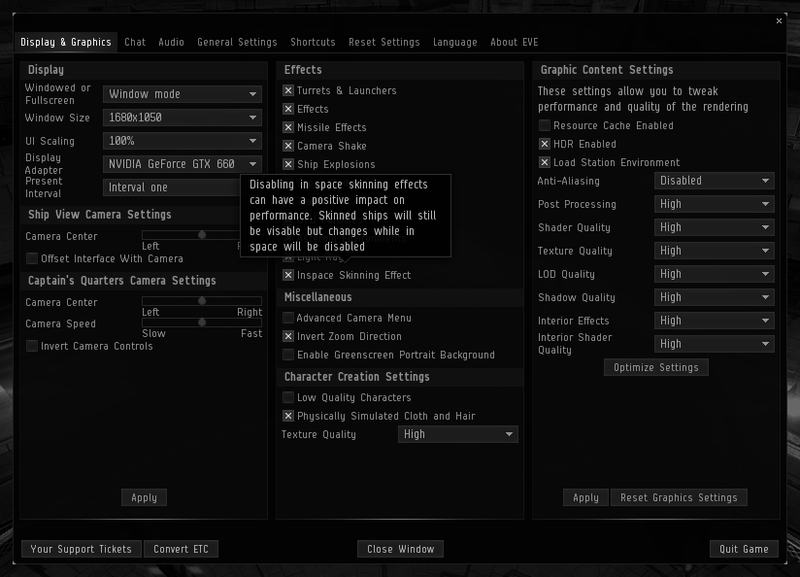 If you are concerned about potential performance issues, you can turn off SKIN changes in space by deselecting "Inspace Skinning Effect" in the Display and Graphics menu. This will not prevent you or other players from changing your SKIN in space, but the effect will not be played and the model will not change until it is reloaded. Purchasing SKINs will work in the same way as all other purchases from the NES. Simply access the NES from the character selection screen or in-game from the sidebar. SKINs will have their own category in the NES. Once a SKIN is purchased, the item will be placed in your account's redeeming queue and can be redeemed for any character in that account as normal. Above: A player has the Nefantar SKIN active for their Rifter, is previewing the Krusual SKIN, and has clicked on the purchase for Aurum button for the Krusual SKIN. The fitting screen allows you to purchase SKINs for the ship you are looking at directly from the left side menu. SKINs will always have a link to the appropriate market category for the SKIN, and they may also be purchased directly from the NES if the item is available. If there are any active time-limited SKINs the amount of time remaining will be shown beside the SKIN name. In this location you can also preview SKINs you may want to purchase, and select your active SKIN from the list of purchased options. By clicking on a SKIN it will change the ships visuals. If the SKIN clicked on is part of the My SKINs category, this also sets that SKIN as the active one. If you wish to return the ship to its default visuals you can do so by simply de-selecting the currently active SKIN. The 3D Preview screen (accessed by clicking on the image icon in the Show Info window) will contain a copy of the left sidebar available in the fitting window. This sidebar will function exactly the same as the fitting window, with all of the purchasing and linking options. Because it can be of any ship, the 3D preview window will also allow you to preview and purchase any SKIN on any ship. 3D previews for specific SKINs are also linked from the show info window of a specific SKIN item. Simply find the SKIN item through in the market, or linked from the SKINs tab of the show info window for the desired ship. Then click on the hexagonal SKIN icon in the upper left to bring up the 3D preview. The character sheet has been updated with a new SKINs section on the sidebar. This section will show you all the potentially available SKINs in the game, and all of the SKINs you currently own, with a countdown visible for time-limited SKINs. In this section, SKINs are divided in to factions/designer categories, allowing you to see the size of your collection both overall, and for a certain faction/designer. Skinned ships will become a base version of the same and a SKIN item for that skin will be added to the owning players redeeming queue. For example: If you have a Megathron Quafe Edition you will get a standard Megathron in the same location as the original, and 1 Megathron Quafe SKIN (Permanent) item placed in your redeeming queue. Skin Blueprints will become a number of SKINs equal to the number or runs remaining on the blueprint. They will all be placed in the redeeming queue. For example: If you have an Abaddon Tash-Murkon Edition 10 Run Blueprint you will receive 10 Abaddon Tash-Murkon SKIN (Permanent) items in your redeeming queue. Skinned Ships and blueprints which are located in a corporation owned location will find the new SKINs in their HQ deliveries hangar. Ships will not move. Skin blueprints that drop in game will become time-limited SKINs that last 30 days once activated. Pirate ships which are skinned through blueprints that drop in-game (4 destroyers, 4 battlecruisers) will become the base ship and 1 time-limited version of the SKIN. Any special edition ships or BPCs in the market or contracts will be cancelled and refunded the ISK it cost to put them up. The ships and BPC's will then be converted over as normal. Codes and referral packs which reference ship skins, or skin items in your redeeming queue will provide a copy of the SKIN equivalent when redeemed. Ship skins BPCs in your redeeming queue will be converted into SKINs in your redeeming queue. Any SKINs in general, which are given to you under this conversion will be put in your redeeming queue. As a way to reward early adopters of the Ship Paint Pilot Program, and in preparation for the new SKIN system release, all existing skin Blueprints will no longer be purchasable from the NES as of the publication of this dev blog. As an addendum, there are a few ships we would like to convert over in the future, and will be doing so in subsequent releases. The Rattlesnake Victory Edition has some technical issues with the underlying model, but once those are sorted it will be converted to a SKIN. The Capsule - Genolution 'Auroral' 197-variant is currently created from an implant (Genolution 'Auroral' AU-79) in a very specific and roundabout way. This will be removed in the future in favor of standardizing it with the rest of the ships as a capsule SKIN. Below is a list of all new SKINs which will be added to New Eden. All of the SKINs below will be available for purchase from the NES and can be resold on the market. If you are interested in purchasing Aurum in order to purchase SKINs from the NES, this can be done from the account management website. Q) Why is there a lack of Caldari and Minmatar SKIN options? A) It will require a little more time in order to address the disparity between the Amarr and Gallente versus the Caldari and Minmatar ship SKIN lines. We are aware of it and are working towards a state of greater parity. Q) Does the skin for a T1 ship also apply to any T2 variants? A) Unless the SKIN item specifically mentions it affects multiple ships it will only affect the ship hulls stated on the item. Therefore a Rifter Nefantar SKIN (Permanent) item will only work on a Rifter, not a Jaguar or Wolf for instance. Q) Will SKINs follow a character if it is traded to another account? A) Yes. Like skills, SKINs will transfer when you purchase a character from the Character Bazaar. Q) Will the SKINs I have active be exposed in the API? A) Yes, we plan on making that information available from the API, however it will not be available on launch. Q) Will the active SKIN on a ship be shown in Killmails? A) On initial release we will not be recording the active SKIN for a ship when it is destroyed. However, we do realize the rich tradition of celebrating the loss of something shiny and it is on our list for further developments in the future. See you in the comments section for this blog.